Mother Elmar Green was the 10th of thirteen children born to the union of John and Carrie Cooks on May 20, 1931 in Madison, FL. She attended public school in Madison County. When she reached adulthood, she moved to Jacksonville, FL, where she met and married Frank Green. To this union 7 children were born. They later settled in Daytona Beach, FL. In 1955, Mother Green was a founding member of Madison Heights Church of God In Christ. 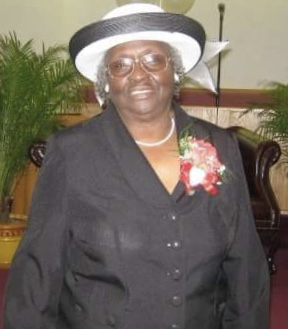 She was well known for her service as the President of the Usher Board at Madison Heights COGIC and as President of the St. Augustine District Usher Board. Years later she was installed as Church Mother. Mother Green worked as a cafeteria manager for Volusia County School Board for 29 years. She was also the first African American Cashier for Sears and Roebuck in Daytona Beach FL and worked there for 18 years. After retirement, she worked part-time at Publix grocery store for 8 years. On the morning of November 18, 2017, Mother Elmar Green lifted her hand, waved and peacefully entered into her eternal rest. She leaves to cherish her memory; Children, Alveda Miller, Daytona Beach FL, Carrie Green, Pembroke Pines FL, Elder Frank Green (Roberta), Tallassee, AL, Constance Green, Daytona Beach FL, Anthony Green, Daytona Beach, FL and Elder Anita Wilson, Pembroke Pines FL; 15 grandchildren, 21 great grandchildren one great great grandchild; and a host of nieces and nephews and other relatives and friends.